Ethan Snapp springs off the diving board Tuesday afternoon at the Hillsboro Swim Club. Several local youngsters are shown playing a game in the deep end Tuesday afternoon at the Hillsboro Swim Club. With a heat wave settled over the area the Hillsboro Swim Club has picked an opportune time to announce several upcoming events that will be open to the public in addition to a ribbon-cutting ceremony at 4:30 p.m. Monday, July 9 hosted by the Highland County Chamber of Commerce. 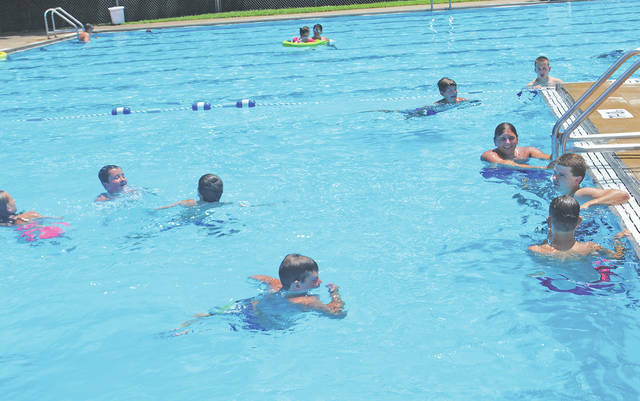 “We’re just trying to find a safe place for kids to do something in the summer,” said Jennifer Howland, a member of the pool’s board of directors. Those who are not members of the pool can take part in the events that are open to the public by paying a $5 fee. • July 13 – Women’s Sip and Shop Vendor Night from 7-9 p.m. It is open to the public for those 18 and older. More than 25 vendors will be on-site including: Keep Jewelry, LueLaRoe, Country Manor Mixes, Scentsy, Pappazazzi, Norwex, Origami Owl, Usbourne, Color Street and more. Howland said there will no swimming that night because alcohol will be available. • July 14 – Moonlight Swim from 8-11 p.m. The event is open to the public with the $5 admission fee. There will be music and food items like pizza and walking tacos available to purchase. • July 20 – Family Fun Night. It is for families and children up to age 12. It is open to the public, according to Howland, but non-members must come with a member. • July 21 – Adult Swim for those age 21 and older. Howland said it is open to the public, but non-members must attend with a member. • July 27 – Moonlight Swim from 8-11 p.m. It is open to the public with the $5 admission fee. • Aug. 5 – Moonlight Swim from 8-11 p.m. It is open to the public with the $5 admission fee. • Aug. 8 – Craft Night from 7-9 p.m. The pool will close at 6 p.m. to set up for the event. • Aug. 10 – Family Fun Night. It is for families and children up to age 12 and is open to the public. Non-members must come with a member. • Aug. 11 – Teen Night from 8-11 p.m. for ages 13-18. Admission is required and it is open to the public. • Aug. 18 – Moonlight Swim from 8-11 p.m. Admission is required and it is open to the public. Guests are permitted to attend the pool with a member up to three times throughout the season by paying a $5 guest fee, and during special events. 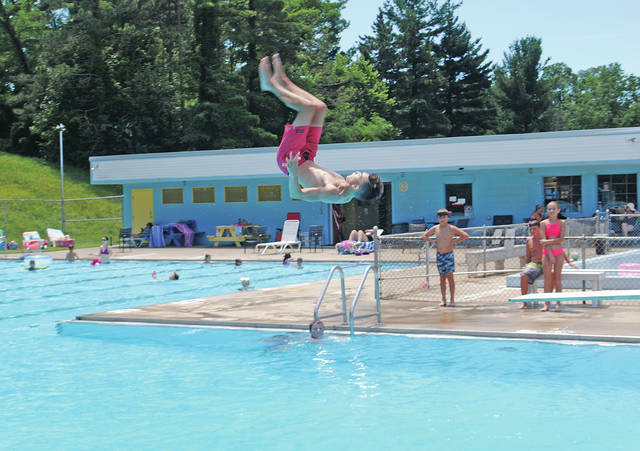 While the pool is not open to the public due to restrictions by its insurance, there are several membership levels to choose from including student, single, family and senior, according to a news release from the Highland County Chamber of Commerce. Howland said memberships are still available for this season with 30 percent off the normal rates. The Hillsboro Swim Club recently became a Chamber member and that is why a ribbon-cutting ceremony will be held at the pool at 4:30 p.m. Monday, July 9. “It has been one very busy summer at the pool so far. From intense plumbing repair, adding wifi, electrical repair, to replacing pool valves, the pool has had a lot of work done. We at the Chamber want to encourage our membership to take advantage of this local business and congratulate them on the improvements,” the news release said. Howland said most of the repairs were made to make operation of the pool more efficient. The Hillsboro Swim Club offers a gated baby pool, a shallow end, as well as a deep end with a diving board. It first opened on May 31, 1958 and is located at 635 W. Main St. The best way to reach the organization is through its Facebook account, where updates on upcoming events are also available. The board of directors are all volunteer, and all of them are able to respond to questions and concerns through the Facebook account, the news release said. https://www.timesgazette.com/wp-content/uploads/sites/33/2018/07/web1_Pool-pic-1.jpgEthan Snapp springs off the diving board Tuesday afternoon at the Hillsboro Swim Club. https://www.timesgazette.com/wp-content/uploads/sites/33/2018/07/web1_Pool-pic-2.jpgSeveral local youngsters are shown playing a game in the deep end Tuesday afternoon at the Hillsboro Swim Club.